There was once a valley, a valley of gold, of guarded secrets, where a mysterious fairy of heady scents lived: the Green Fairy. She born from a secret elixir made from absinthe and loved to surround herself with objects of worship: a perforated spoon, a piece of sugar, a fountain of cold water. Only when the icy water touched the elixir the fairy’s miracle could be witnessed. The drink, initially transparent, becomes dull, circles appear, waves begin to rise, whirls and twirls are formed and the rebellious spirit of the Green Fairy appears, she seems to come out of the water and come to life. Boldly and mischievously she visited barns, penetrated the stills, perfumed the kitchens, brightened up the taverns and charmed all who approached her. One day, in search of new adventures, she left her valley to go into the wide world. She stopped at the Lumière residence where she came to know fame, and ended up in our Piedmont region. She passed by the Parisian cafès where women lost their virtue, men lost their common sense, and the poets became cursed. The fairy had turned into an evil being. A real persecution began, a witch hung, but the fairy always mamaged to escape, to hide, to flee from her faithful servants, illegal distillers. The years passed, but the fairy remained elusive, she was senn coming out at night from the secret cellars, she was seen at sunrise, near a secluded inn, in the forest or at the turn of a path. The fairy roamed around. She appeared and disappeared. The fairy dreamed and, beign elusive, only made herself seen by those who were worthy, by those who loved her. The fairy understood the Berta family’s passion: the passion for the distillate. The passion for Artemisia that she is born from, like a whirlwind. 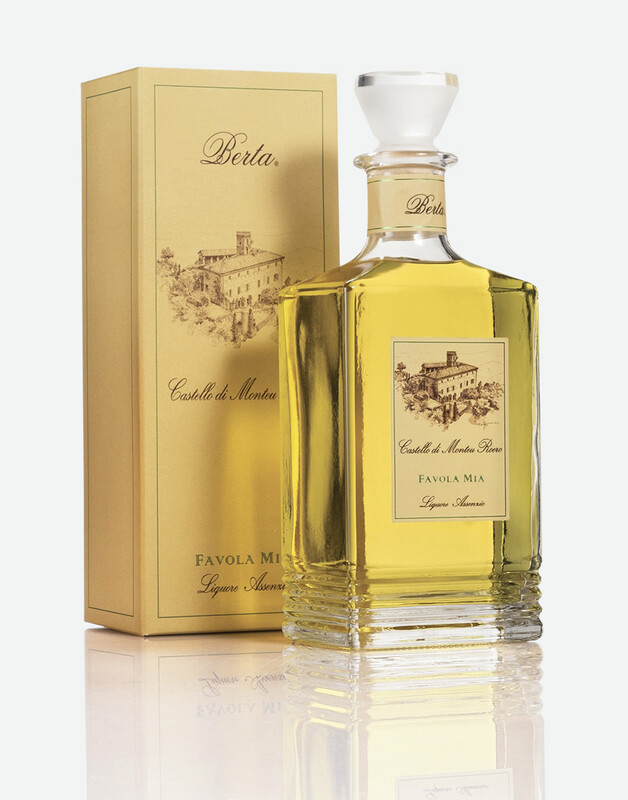 Hidden in the Monteu Roero Castle, she has demonstrated and unveiled her sweet and sinuous nature. Like a fairy tale: “La Favola Mia” (My Fairy Tale).